Anything can be painted with watercolours: from a realistic portrait to fictional alien civilisations. 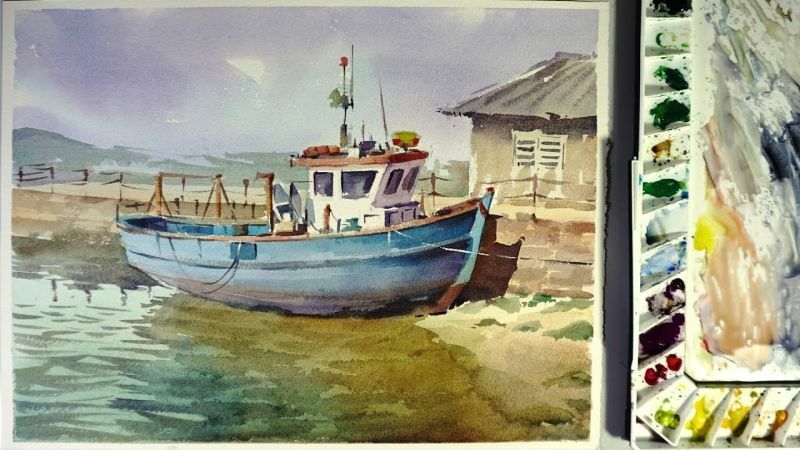 Many think of watercolours as a complicated artistic tool. However, everything that you really need to be able to learn how to paint with watercolours is to simply start doing it! 1. Pay attention to brushes. Use natural bristles (for example, kolinsky sable-hair or squirrel-hair) of various diameters and shapes. 2. Use a special quality paper for watercolours. Its weight is similar to cardboard, but differs from the latter by roughness, which helps the paint to adhere to the paper. 3. Get enough materials: plastic/glass palette, pieces of fabric, water container, paper adhesive tape, sketching pencils. To create special effects, you can use a toothbrush, porous sponge, white gouache. 4. Use palettes made of non-absorbent materials: glass, plastic, ceramics. A special drawing board will also be handy. A piece of paper, soaked in tap water, should be attached to it. 5. Be careful when working with watercolours. This paint hardly allows for correcting any errors. Hence, as a rule, you should first work with bright areas of the painting before proceeding to the darker ones. 6. Be confident about the selected colour. Try a newly created colour on a spare piece of paper. If you are satisfied with the result, proceed to painting the desired area. 7. Keep track of the sharpness of the brushes. The only way to ideally paint small details is by using a sharp brush tip. 8. Never rinse the brushes in chemical agents. Read here how you can clear your brushes!